Here it is, my fourth box of 2000 Fleer Focus, the second box sent to me from Peter of Dropped Third Strike. Base: Tons. Someday I’ll organize the base from these two boxes. If anyone would like a team set, I’ll gladly send one. Final Thoughts: This box certainly wasn’t short on the inserts, which is good, but pulling the same inserts over and over again gets a bit annoying, especially when you get duplicates in the same box. Once again, I was haunted by Erubiel Durazo. While it wasn’t nearly as good as the autograph from Box 1, it’s still an autograph so no complaints here. Once again, I have to give a huge thank you to Peter for everything! 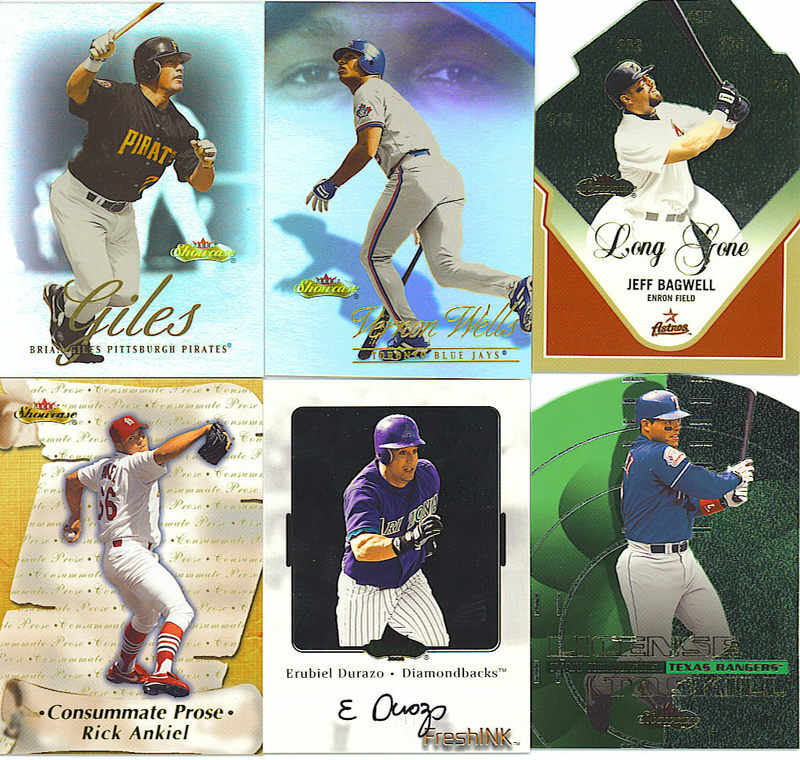 Here are the results of my third box of 2000 Fleer Focus, the first box sent to me from Peter of Dropped Third Strike. Base: Tons. I must have at least two complete base sets by now. Masterpiece Mania (/300): Charles Johnson (158/300) and Paul O’Neill (015/300)! 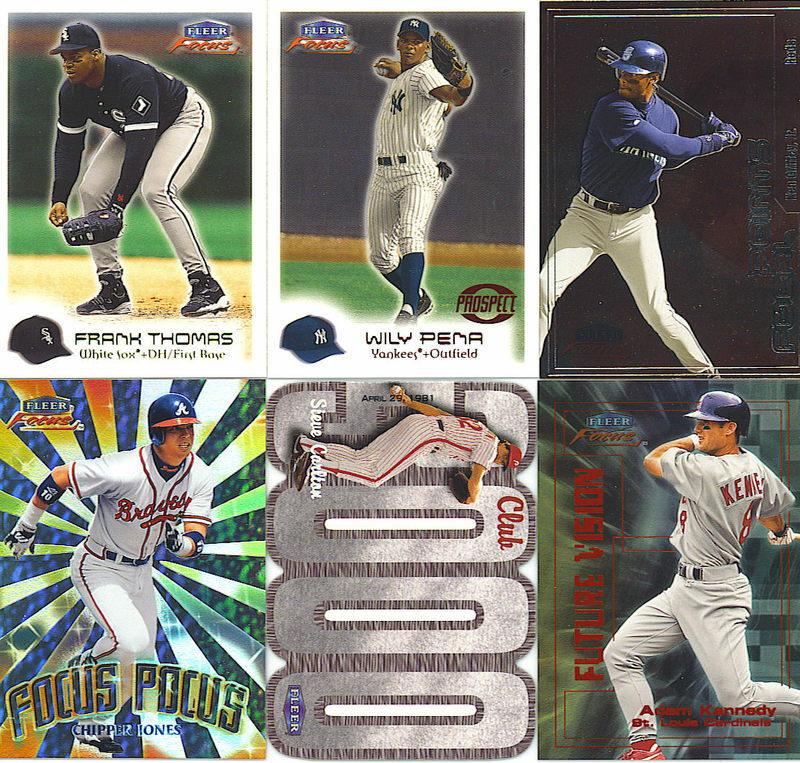 Focal Points (1:6 packs): Mike Piazza, Chipper Jones, Tony Gwynn, Ken Griffey, Jr. Final Thoughts: Compared to the previous two boxes, this one contained one less prospect card and one less Focus Pocus insert. However, it did contain one extra Masterpiece Mania parallel and it happened to be of a player I collect, Paul O’Neill! What are the odds?!? Despite the rest of the box being a bit lackluster, pulling a ‘PC’ card is always a huge plus! Base cards: After falling 9 cards short of a base set in the first box, I was able to complete to complete the set with this box. As was the case with the first box, two prospect cards were pulled. This time, they were both of the action (as opposed to portrait) variety: Wily Mo Pena (2453/3999) and Adam Piatt (2486/3999). At this time, I have no intentions of putting a second set together or collecting the shortprints so if you need set fillers, let me know. Masterpiece Mania (numbered to 300): While the prospects seem to unofficially fall at a rate of two per box, the Masterpiece Mania cards seem to fall at one per. These green-foiled parallels are limited to 300. I pulled an Ismael Valdes (026/300), who bounced between the Dodgers and Cubs in 1999-00. Focal Points (1:6 packs): The most common inserts found in this product are the Focal Points inserts. Falling at four per box, there are fifteen cards in this set. Between the two boxes, I have yet to pull any doubles. In this box, I received Mike Piazza, Chipper Jones, Tony Gwynn, and Ken Griffey, Jr. These currently put me at 8/15 for the set. 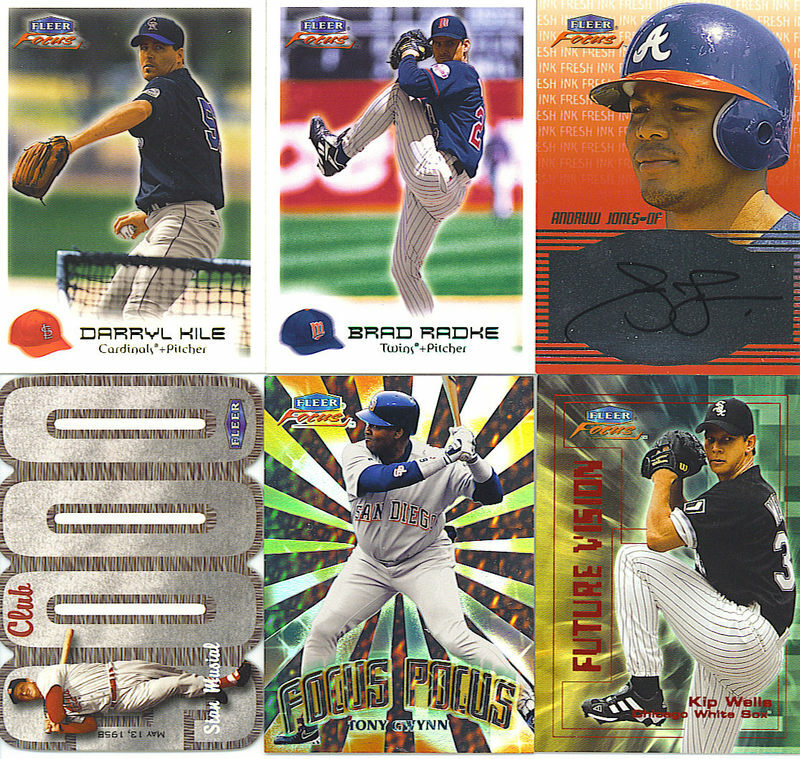 Future Vision (1:9 packs): These holofoil inserts showcased the game’s top prospects at the time. Seeded at two or three per box, there are 15 cards in the set. I pulled cards of Mario Encarnacion and Adam Kennedy. Woohoo! Two boxes in a row with a Kennedy insert. Too bad my Kennedy card isn’t like the one that Mario at Wax Heaven pulled. Focus Pocus (1:14 packs): Ah, the good ol’ trippy ’90s inserts. Seeded at roughly two per box, this insert set featured ten of the game’s greatest. My pulls were of Chipper Jones and Cal Ripken, Jr.
Club 3000 (1:36 packs): LIke I mentioned in the original review, Club 3000 was a cross-brand promotion in which fourteen members of the 3000-hit club were featured on inserts and game-used memorabilia cards throughout five different Fleer products. No more than three subjects could be found in each particular product. In Fleer Focus, the three subjects were Stan Musial, Steve Carlton, and Paul Molitor. I pulled a Steve Carlton insert in this box. Unfortunately, there were no game-used swatches. Final Thoughts: Despite not have an autograph or game-used hit, I still wasn’t disappointed with this box. The inserts delivered as promised and I had no inserts repeating from the first box. Fleer Focus has always been a personal favorite of mine. It has some very good potential as far as hits go (Fresh Ink, Club 3000 Memorabilia, etc.) and an affordable price. For about $30, you can’t go wrong with this one. Base set: In typical Flair fashion, these cards have a black and white background and refractor-like finish. The font is gold and larger than in the previous sets. The base set consists of 100 veteran cards and 40 prospects. Of the prospects, the first 15 are numbered out of 1000 while the rest are numbered out of 2000. There’s also a variation to the prospects called Showcase First. These cards are horizontal are limited to 500. My box yielded 98 percent of the basic 1-100 set with 5 duplicates. The cards I am missing are 49 and 57. I pulled prospect cards of Vernon Wells and Carlos Guillen, both of which are numbered to 2000. I also got a “Showcase First” card of Mark Mulder. Noise of Summer (1:10 packs): Oh look, another lame play on words by Fleer. These card are predominantly orange and yellow, and there’s really not a lot to them. I received Alex Rodriguez, Derek Jeter, and Jeff Bagwell (again!). Final Answer (1:10 packs): Ok, I understand that Who Wants to be a Millionaire was one of the hottest primetime shows (if not the hottest) back then, but this insert set just looks silly to me. I admit I used to be an avid watcher of the show, but I didn’t want to see it clashing with sports cards! These inserts are green and feature the player in a mock television screen, with a ton of little question marks in the background. Let’s see. Question marks? Check. Green? Check. My gosh, The Riddler was working for Fleer?!? Check these out for yourself. The backs of these cards do provide some interesting tidbits though. Because of these cards, I learned that Sammy Sosa’s most surprising dream was to win the Powerall lottery and buy the Cubs! Aside from Sosa, I also pulled Vlad Guerrero and Cal Ripken, Jr.
License to Skill (1:20 packs): Here’s a nice green die-cut insert that’s got a “bulls-eye” theme to it. My player was Ivan Rodriguez. Hey, where’s my Jeff Bagwell?? On a side note, they seemed to like the color green when designing the inserts for 2000 Showcase. Club 3000 (1:24 packs): Ah, here we go again, a Club 3000 insert. I discussed the details of this set in my Fleer Focus review, but for those too lazy to scroll down, just click here. Once again, I got a Cardinal, this time Lou Brock. And once again, there were no game-used swatches to be found. It’s still a nice insert though. Fresh Ink (1:24 packs): These autographed cards were seeded 1 per box and featured a pretty nice checklist. Unfortunately, I got Erubiel Durazo, who seemed to show a little bit of promise a few years ago, but got injured and is pretty much obscure now. These are the only cards you’ll find here that lack any color. The player is featured in color, has a silver box surrounding him, and a white border surrounds all that. It’s just a little on the blah side if you ask me. Of course, I probably wouldn’t have minded as much if I had a better pull, but you can’t win ’em all. Final Thoughts: Overall, if I had to rank Flair Showcase by year, 2000 would probably be somewhere in the middle (UD made it GARBAGE). It’s not a particularly bad product. The cards look good and most, if not all, of a basic set could be completed with just one box. You’ll find 1 autograph per box, a game jersey card in every 3 boxes, and a Sweet Sigs ball auto (think Sweet Spot) in every 10.5 boxes. Fans of the older multi-tiered Flair Showcase sets (like yours truly) will be disappointed with this set while those looking to score a nice pull may enjoy it more. The fact that there is only 1 set and that “Legacy” parallels are virtually impossible to find (only 20 of each compared to the customary 100) are a downer in my personal opinion, but it all depends on your personal taste. If you decide to try one of these boxes, hopefully, you’ll have a better break than me! As always, thanks for the read and good luck with your own box breaks! Base cards: There are 250 base cards in this set with 225 veterans and 25 prospects. On each veteran card, the player’s name and information is written in gold foil, next to a little picture of his team’s cap. Each prospect card has red foil on the front and is numbered to 3999. However, each prospect card has 2 variations. Of the 3999 of each prospect, the first 999 feature a different photgraph. The first 999 feature a close-up portrait shot, while the remainder feature longer-distance action shots. In this box, I received 216 of 225 basic cards with 17 duplicates. I pulled 1 regular prospect card (Chad Hermansen: 1684/3999) and 1 portrait prospect card (Mario Encarnacion: 0691/3999). Masterpiece Mania: All 250 cards in the set have a parallel called Masterpiece Mania. Basically, these just feature green foil on the front and are numbered to just 300. I pulled a Brad Radke that sure as heck doesn’t look like it has green foil in the scan! There are also Masterpiece and Masterpiece Error parallels, of which I pulled none of either. The Masterpiece parallel has purple foil and is numbered 1/1. The Masterpiece Error versions have the same purple foil, but lack the numbering on the back. These cards were test issues that were never meant to be released. They don’t book for very much and I’m not sure how many found their way into packs, but I don’t think it was the whole set. Can you imagine finding a card in your pack with the purple foil and then finding out it was just a stupid error card?? That would be horrible! Focal Points: The first inserts I pulled were the Focal Points inserts. These cards are seeded 1 in every 6 packs. These cards feature a solid color background, which also contains a second faint picture of the player. The players I pulled were Derek Jeter, Frank Thomas, Juan Gonzalez, and Jeff Bagwell. There is also a parallel to this set called “Striking,” but I did not receive any of those. They are limited to 50 copies. Focus Pocus: Here’s a clever play on words by Fleer. Despite a corny name, these are another attractive insert set. These cards are seeded 1 in every 14 packs. I received Tony Gwynn and Ken Griffey, Jr. in this set. Doesn’t it look like the player’s body is emitting some kind of crazy rays? Fresh Ink: Last but not least, came my hit of the box. The Fresh Ink inserts are found only 1 in 96 packs, but there is no shortage of stars in the set. Potential pulls include Derek Jeter, Alex Rodriguez, Randy Johnson, Cal Ripken, Jr., Tony Gwynn, Josh Beckett, Mike Mussina, Johnny Damon, Jason Giambi, Edgar Martinez, and others. I saw the authentication on the back at first and thought, “please let me get a nice star autograph! !” I flipped it over and saw Andruw Jones! Despite the fact that he’s started to fall off a little in the past couple years, I was still very happy with this pull.